While the rest of the world sat in front of their office desk to have a barely fulfilling life, two teenagers from Spain, Emilio Matinez, and Ivan Martinez, took the social media world by storm and started to earn in hundreds of thousands. 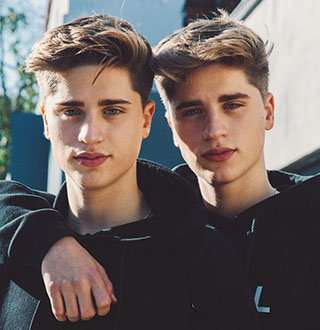 The Barcelona-natives are famous in the social media world as charming and goofy Martinez twins, who run a YouTube channel, Martinez Twins, with millions of subscribers. They also have a combined Instagram following of over 10 million. We present to you some interesting, lesser-known wikis about the twins who have impressed the social media by their charms, including their age, birthday, height, sister, parents, haircut, net worth and other facts. You Might Also Like:Disney Star Ethan Wacker Wiki At Age 16; Height, Birthday, Family, Net Worth All Revealed! On 10 May 1999, twins, Emilio Martinez and Ivan Martinez, were born in Barcelona, Spain. They grew up in a Roman Catholic family with their parents and elder sister Rebecca. While it is not known where the twins went to school, it is known that they took some course in the English language to reach the wider audience as their native tongue is Spanish. Not too different in regards to physical features, both twins stands at the height of 5 ft. 10 inches. 2. How Martinez Twins Earned Their Mouth-Watering Net Worth? With their spectacular haircut, the twins, who only celebrated their nineteenth birthday this May, are already stars on social media. They have the combined of around 11 and a half million followers in the Instagram (Emilio has 6M and Ivan 5.5M followers) and 4 million subscribers and 400 million+ views on their YouTube channel. According to wikis, from their YouTube channel, the twins earn the yearly income ranging from $ 6 thousand to staggering $ 100 thousand, increasing their already hefty net worth of half a million dollars each. The eldest of Martinez siblings, Rebecca, is also an Instagram star. Although not as famous as her younger brothers, Rebecca has over 300 thousand followers on her Instagram. Rebecca mostly posts photos from her travels and tours and since she recently graduated from college, she is on the tours a lot. She is also an avid tennis player. Previously they were part of Team 10, an entertainment group based in LA, who live together and produce entertainment contents, like skits, music videos, caricatures etc. As a part of Team 10, Emilio and Ivan lived in LA for a while, but then they left the group and came back to Spain. After that, the twins also make and perform songs; they have released three songs via their YouTube channel each of which has gone on to garner millions of views. It seems as if Matinez twins are trying to conquer all the fields of entertainment and to earn more and more following; the brothers have been successful till now. But how their future course will run, it is yet to see.